What would it take to bring a vibrant and bustling Metropolis to its very knees? The simple answer to this question is…not very much! Any type of civilization takes a great deal of time and industry to create, but precious little effort to destroy. Poor choices or a series of unfortunate events can lead to catastrophic consequences. When you throw in the inherent fragility of the human psyche, it seems as though we have all the ingredients for the perfect storm. If such concepts intrigue you, then The Zoo: An Allegorical Adventure by author Stephen Black, may be a tale which will garner your attention. Indeed, readers who enjoy dystopian themes which are peppered with satire may very well find what they are seeking in this unique novella. The actual story begins with a boy and his grandfather visiting a once booming city which now lies in ruins. How did this possibly come to be? As readers, we soon find out the answer to this question through a story told by the grandfather. It is not your typical tale however. It is told by looking back at the lives of the various zoo inhabitants. It is through the description of these animals, and examination of their individual motivations and desires, that the answer to the mystery of the ruined city is eventually revealed. Could the various animals really have caused such a devastating event? Or is there more to this story than meets the eye? There are a variety of intriguing themes which are explored throughout this novella. Perhaps the most pressing one however is that of cause and effect. In short, how our choices can have a dramatic impact upon our own future, and inevitably the lives of others as well. Does the term “Butterfly Effect” ring a bell? It is essentially a moralistic satire which examines the cause and effect of human behavior by using animals to portray the former. I found it to be a fresh and imaginative concept which brings to mind other works such as Animal Farm by George Orwell. Be that as it may, the plot of the tale does drag on in parts. It seems as though more effort is spent on presenting the moralistic message than is on letting the story unfold naturally. This pedantic nature tends to stifle what is otherwise a wonderful storyline. As for the characters, I felt the author did a very good job at developing them. The reader is able to easily visualize the various zoo creatures and then associate them with actual humans they have encountered. It is exceptionally easy to make such connections with our current society and politicians in mind. The ego driven Larry the Monkey, high strung Nadine the Parrot and attention seeking Karl the Donkey to name a few. Larry was certainly developed in the most detail, and his portrayal was very similar to the rise and fall which occurs with many celebrities and politicians. In my personal opinion, the animal characters in this book are its strongest trait. 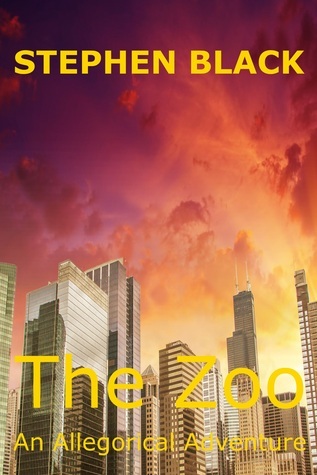 Overall, The Zoo is a story which has many positive aspects. Intriguing themes, interesting characters, and a dystopian setting which is quite easily visualized in the mind. Nevertheless, it has some drawbacks as well. For instance, the plot development does not have a very smooth flow as it gets sidetracked with depicting the moralistic message. The reader wants the story to reveal the message through actual events rather than pontification. Also, there is a need for a proofreader with this novella. Typically, I ignore the mechanics when I am reviewing a book, unless it ultimately distracts from the story. In this particular case it does. Sign into Goodreads to see if any of your friends have read The Zoo.